NYC, 04/21/2019, 1:30PM. Color Adjustment (1992): Blacks on TV. 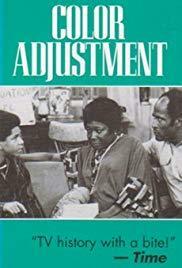 Color Adjustment analyzes the evolution of television's earlier, unflattering portrayal of blacks from 1948 until 1988, when they are depicted as prosperous and as having achieved the American dream, a portrayal that is inconsistent with reality. Black actors Esther Rolle, Diahann Carroll, Denise Nicholas, and Tim Reid and Hollywood producers Norman Lear, Steve Bochco, and David Wolper reveal the behind-the-scenes story of how prime time was "integrated."